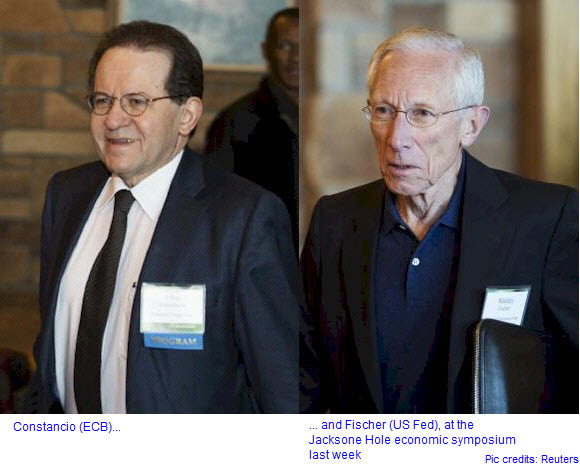 While the people who are perhaps the major players on the world economic scene, Janet Yellen, Chair of the US Federal Reserve, and Mario Draghi, President of the European Central Bank (ECB), were not in attendance at the annual Kansas City economic symposium, held at Jackson Hole, Wyoming, last week, they were represented by their respective deputies, both of whom made contributions that will be of interest to Foreign Exchange traders. Vitor Constancio, Vice President of the ECB, made it plain that the purpose of Eurozone Quantitative Easing was not to weaken the Euro. It is, rather, intended to stimulate inflation. And, according to him, it is working. This stance would accord well with comments made by the ECB on many occasions, when it was made clear that the fear of deflation, or negative inflation, is the one big concern that the central bank has. While a weaker Euro would, conceivably, make Eurozone exports more attractive and even lead to job creation, this is not and never was a part of the ECB mandate. It is perhaps no accident, therefore, that even in the light of unprecedented QE activity, which might otherwise have been expected to weaken the Single Currency, it has instead shown a notable resilience on global Forex markets. Stanley Fischer, Vice Chairman of the US Federal Reserve, is himself confident that the low inflation bugbear in the US has been already dealt with. He stated at Jackson Hole that US inflation will likely rebound as the effects of falling oil prices and slack in the US labour markets fade away. His concern now is that as “… monetary policy influences real activity with a substantial lag, we should not wait until inflation is back to two per cent to begin tightening”. This month’s (September 2015) FOMC meeting, on the 16th and 17th, will be even more carefully watched by the markets than ever. Academic papers presented at the symposium came to a number of conclusions. One of the more interesting ones for this observer held that, because of thirty years of globalisation, the effects that might have been expected on a nation’s economy by falling (or rising) currency values no longer have the impact on said economy that once was the case. This is because of the very much increased interaction in global trade where, for example, the beneficial effects on exports of a lower currency are greatly offset by the corresponding increase in the cost of imported raw materials and component parts for those same exported finished goods. Another paper pointed out that economic policy was extremely complex, too complex at times to be understood in terms of the established economic models that have been in use up to now. Ben Bernanke, former Fed Chairman, made similar point in his blog recently, when he said that policy should be determined by the Fed and other central banks in a systematic manner, but not in an automatic way. There is no place for robots when it comes to monetary policy. This resonated with us, because the same philosophy applies to algorithmic Forex trading. While automated systems, like the OmicronFX Mandelbrot routine, have the ability to impose discipline and to carry out the operation of a strategy in a manner that could not be done by a human trader, no matter how diligently he or she operated, in the case of Mandelbrot at least it is not by any means a robot. It must be tended, monitored, and its assumptions continuously tested and refined.